Relax & Enjoy... Just 4.9 Miles from Disney! 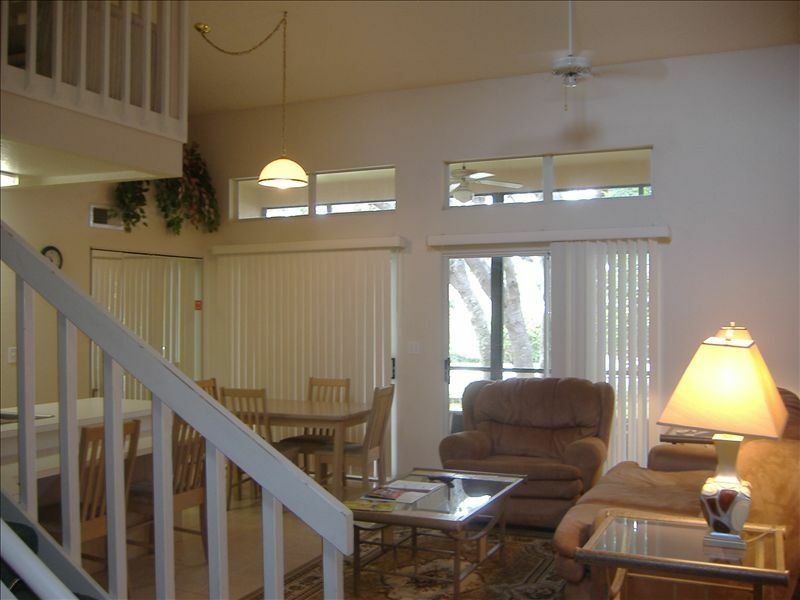 Why not relax and enjoy an actual vacation at our Villages of Mango Key condominium. This 33 unit, all townhouse condominium complex is located just 4.9 miles west of Disney on the quiet end of Kissimmee just off Route 192. Mango Key is a gated complex with a large heated pool and hot tub. Husband and wife from Littleton, Massachusetts. We began visiting this property in 1992 when it first opened and finally bought in 1997. We still visit each year and our daughter Angela now works at Universal Studios Orlando. Our unit is in a perfect location - both close to all of the major attractions and on the quieter west end of Kissimmee in a small complex where the pool is rarely if ever crowded. Very spacious unit, great on site management staff, everyone who stays here loves it! small lake on property - nice view. free parking right in front of unit. (3) 43" hi-def TV in living room, 32" high def TV's in each bedroom. 41 channel Cable TV including 3 HBO's & Showtime, Coffee Maker, Free in unit Washer & Dryer, In unit Wireless High Speed Internet. Spacious well equipped condo. Very clean and well maintained. Great location with easy and ample parking. Quiet neighborhood. Close to grocery and parks. Owner responsive to questions about condo amenities. Kitchen has ample cooking gear. Matching dishes and glassware for 18+. Updated bedding and carpet. We'll be back again! Townhome has all wood laminate floors very clean. When we got there towels on bed where folded as flowers neat touch. Travel to Disney was about 5 miles and universal about 20 miles. Orlando traffic is terrible between 9pm-midnight. We where family of 4, All the beds slept very comfortable maybe better than my own at home. Pool visits where quiet just my family, Necer saw any other home owners in pool. Publix store nearby and just about any restaurant you can imagine with a few miles of town home. Property owner very easy to work with and quick to answer questions. This rental far exceeded my expectations.